A hot bowl of soup is absolutely nourishing and all-time favorite of all age groups. This warm and comforting meal is a healthy option for hypertensives as well, the only condition being that the soup should be low in salt and if possible do not use your salt shakers at all, instead use a lot of herbs and adjuncts like pepper, basil, tamarind, amchur powder, lemon and mustard powder to make your taste buds happy. You can also add a crunch of veggies to it. Adding vegetables will not only give it some bulk and flavor, but will also add a lot of essential nutrients to your soup. You can use low sodium vegetables like garlic, ginger, tomatoes, eggplant etc. Try and avoid prepared and canned soup, even those marked “low sodium”, are usually high in sodium and can make an otherwise healthy food choice unhealthy. Prefer to make homemade soups without adding any sodium flavorings to it. The best time to have soup is between the meals, when you are hungry and you crave for some fried snacks, fill up your tummy with some healthy soup. 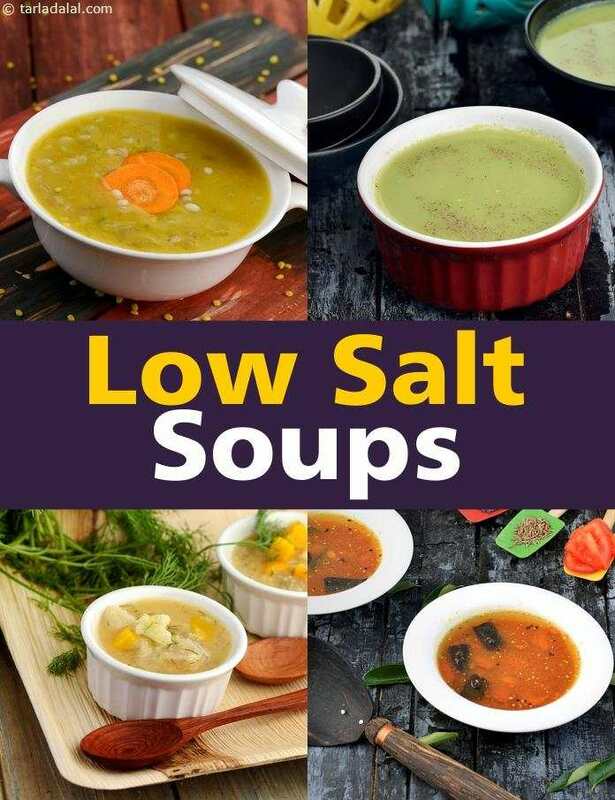 Here we bring to you a range of low sodium soup recipes like Carrot and bell pepper soup, one meal soup, low salt green pea and basil soup and nutritious pumpkin soup. Have a scrumptious and healthy low sodium treat and manage your blood pressure levels!